A Danish pancake that has a round ball-like shape rather than a flattened rounded shape, like a crepe or a traditional flatbread pancake. 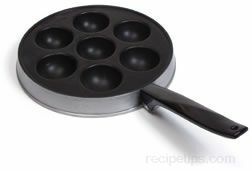 The aebleskiver is made with a batter that is often mixed with fruit or other fillings and poured into a pan with individual round indentations that are molded into the pan. It is a cooking utensil designed specifically for making this pancake ball. One half of the pancake bakes and when the bottom half has turned golden brown it is rolled over manually to bake the other side. Aebleskivers are most often served for breakfast or brunch, but they can also be filled with a savory filling and be served as an appetizer. The Aebleskiver is also known as an Ableskiver, Aebelskiver, Ebleskiver, Danish Ball Pancakes, Krapfchen, Merfeilles, Norwegian Puff Balls, Poffertjes, and Puffers.